With an intuitive stockweld, a very good trigger, and quick and easy operation, the MR-1 is one of the most desirable HD / utility rifle platforms available. The soft-shooting MR-1 takes standard AR magazines as well and is good to go right out of the box. 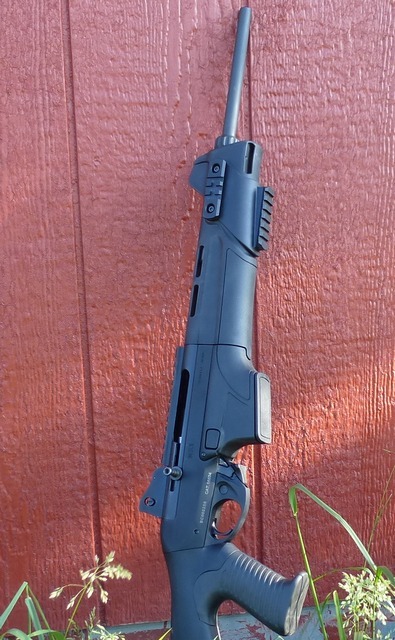 Three years ago we reviewed the Benelli MR-1 .223 Remington / 5.56 x 45mm NATO autoloading rifle. With the continued interest in general purpose HD and tactical rifles, we've decided to take a closer look. The Benelli MR-1 has been one of the best-performing .223 autoloaders tested in the last several years, so it deserves more attention. The basic specifications are listed as follows. The Benelli MR-1 has a .223 C.I.P chamber and is marked as .223. According to Benelli, it is compatible with .223 Remington, 5.56 x 45 NATO, and of course .223 C.I.P. Commercial .223 Remington ammunition is all I use in any of my .223 rifles and it is all that I have used in this rifle as well. There have been no malfunctions or other issues to date, regardless of ammunition brand or projectile weight. The MR-1 bolt is released just by pulling it back, or using the bolt release at the front of the trigger guard. A total of four Picatinny rails are included, the largest on top of the receiver with a trio of smaller rails on the forearm. This forearm is listed as "optional" by Benelli. The large rectangular magazine release button, shown above, is duplicated on the left side of the rifle. The trigger on the Benelli MR-1 breaks at about five pounds, after a small amount of initial take-up. This is refreshing change from many of the horrible triggers on Armalite Rifle or Armalite Rifle variants out there, such as the nasty 9-1/4 pound break on the recently tested Ruger SR556E. Tastes vary, but the hoary AR platform is both antiquated and aesthetically vulgar as far as I'm concerned. The watermelon-killing Air Force target rifle of 55 years ago poops where it eats, and has been one of the most embarrassing episodes in U. S. military history. Despite the clumsy attempts to rebrand the Armalite Rifle as the Modern Sporting Rifle, it clearly is anything but. Though the mimicry of anything adopted by the U.S. military is understandable, the utility of the Armalite rifle remains a mystery. Collapsible stocks might seem like a good idea at first blush, but they destroy the usefulness of any optic that has fixed eye relief. If you wear Kevlar underwear and trip or snag on car doors, perhaps they make a bit more sense. It isn't what makes sense for a utility or HD rifle, though, where you want something simple, reliable, intuitive, and something that offers a consistent stockweld. Collapsible stocks certainly do not. Law enforcement professionals that I have known for years invariably choose simplicity over gimmickry. 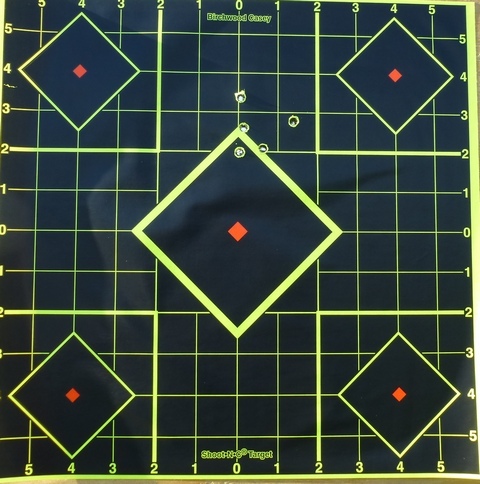 A representative five quick shots at 50 yards using tough, 55 grain TSX, all-copper Barnes VOR-TX ammunition with the factory iron peep sight array. Out of the box, the Benelli MR-1 comes with all you need, featuring a snag-free peep sight that is adjustable with the rim of 5.56 brass. Setting up at 50 yards, despite the fairly thick front blade, it was easy to hold rapid-fire five shot strings within 1-1/4 inch or so. At 50 yards, that's certainly minute of coyote, minute of groundhog, much less minute of bad guy. Self defense situations are measured in feet, of course, not yards. Once in a while there is discussion about how much the 223 is nerfed by use of a 16 inch barrel, with some claiming it is little more than a .22 Hornet. Not true, though there is velocity loss with shorter barrels. Factory velocity with Federal P22B 45 grain ammo (24 inch test barrel) is published at 2690 fps 15 ft. muzzle velocity. 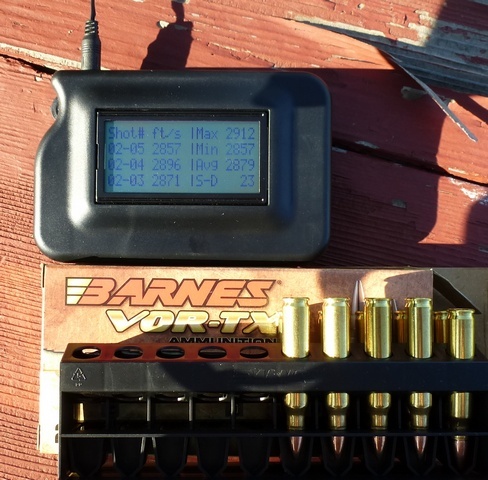 Using the MagnetoSpeed bayonet-mounted chrono, as you can see above, with the heavier Barnes bullet the average actual muzzle velocity is 2879 fps, a substantial jump from the .22 Hornet that of course yields not only a couple of hundred feet per second weaker velocities with a longer test barrel, but also shows velocity loss in concert with barrel length just as the case with the 223 Rem. This is just part one of the MR-1 coverage. The next phase is enlisting the help of LE professionals, for a pro and con comparison of the Benelli MR-1 vs. the M-4 AR platform. To be continued. ©1999 - 2012 Randy Wakeman. All Rights Reserved.